All students studying with DGES do so in an environment which combines personal support, hands-on experience with theoretical background, and cutting edge ideas with traditional values. Students examine topic and case-studies from around the world, and make the most of the superb natural laboratory in the Aberystwyth hinterland. They are taught by experienced staff, all of whom are actively engaged in research, and many of whom have worked or studied at universities around the world, including North America, Australia, New Zealand and South Africa, as well as Britain, bringing a global perspective to their teaching. An Academic Tutor is specified for each student to discuss and guide their progress through the course of their degrees. Academic tutorials provide small group teaching to support your studies. Tutorials introduce allow students to develop further key themes and ideas within their discipline with ample opportunity for direct feedback on coursework. Students are encouraged to evaluate and reflect on their performance and how it may be improved, with the support of their tutor. As part of the tutorial programme students take part in the Academic and Personal Progress Review (APPR) programme which requires students to reflect on their learning, and engage with their future career intentions. Aberystwyth University have a dedicated Careers Service that offer support and courses throughout the academic year, designed to give students the best chance of finding employment both during and after their time with us in DGES. To support the Tutorial programme, Personal Tutors are allocated to each undergraduate in the first year. In the second and third years your Academic Tutor acts as your Personal Tutor. Programme Coordinators and Year Group Tutors are lecturers who supervise and are responsible for the co-ordination, organisation and delivery of the academic programme, on behalf of DGES's Director. All modules have a Module Coordinator; they are lecturers who are responsible for the individual modules we offer, and they are the first point of call should you have queries relating to a particular course. For most students, moving away from home for the first time can be a daunting experience, albeit an exciting one, too. Aberystwyth prides itself on being a very happy University, with the majority of our students encountering no problems during their time here. However, there are structures within the Department and University to provide support to students if problems do occur. The Department provides personal support on welfare matters through Year Group Tutors and Personal Tutors. Year Group Tutors are designated within each degree scheme to deal with pastoral, welfare, attendance, assignment deadlines and assessment matters for their students. At Aberystwyth we believe in the importance of treating people as individuals and encouraging their learning to maximise personal development. 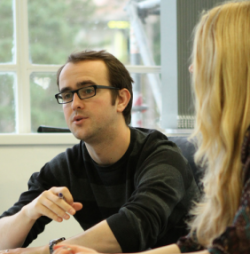 Throughout all years of a degree at DGES, students meet regularly in small groups (typically five students) with an academic tutor to discuss key issues in their chosen degree scheme, develop study skills and careers awareness, and expand on lecture topics. Small group work at the beginning of the first year helps to forge friendships between students, many of which last beyond their time in Aberystwyth. Within the University, and located within the heart of campus the Student Support Centre provides a one-stop-shop for general enquiries and a variety of specialist services. These include; Financial advice, learner support, medical advice, disability support, advice for parents and general issues related to your personal development and wellbeing. Aberystwyth University also operate a Signpost Mentoring Scheme; a peer-support initiative designed to help new students settle into university life.